In 1982, Japanese-based Yonex introduced the world’s first all-graphite head driver, and the company has continued to achieve a lot of firsts in the golf industry; the company introduced the first widebody club heads and all-graphite head on an iron. The company’s new line of Nanospeed 3i e Hybrid Irons includes long irons, mid irons, and short irons, each designed specifically to conquer parts of the course. The Yonex Nanospeed 3i e Hybrid Iron is designed to replace the traditional 3-iron. Its wide cavity and large sole create a club that has a deep center of gravity. With a 3D Power Weight System, the clubhead’s weight is distributed for a high moment of inertia and more control. The Yonex Nanospeed 3i e Hybrid Iron is a top pick from Yonex’s Nanospeed 3i line. The hybrid replaces traditional long irons that can be difficult to control and achieve desired distance. Like the rest of the Nanospeed 3i clubs, the hybrid has an exclusive Yonex NS100I carbon graphite shaft. Another exclusive Yonex feature is the 3D Power Weight System, which controls the weight at the heel and toe of the head for a higher moment of inertia. The hybrid’s cavity is wide and its sole is long for a low center of gravity that launches the ball higher. Its head is compact in size for less twisting and greater forgiveness. The Yonex Nanospeed 3i e Hybrid Iron is available for right-handed players and has a 19 degree loft, 59 degree lie, and 40.5 inch length. The head is made of multiple materials: graphite for the crown and stainless steel for the face and body. Professional and amateur reviews of the Yonex Nanospeed 3i e Hybrid Iron have been very positive. Customers have praised the hybrid as easier to use and more consistent than traditional irons. 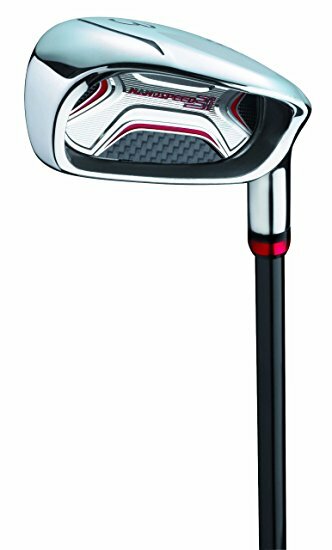 The hybrid’s performance was excellent: “ball flight is high and distance excellent,” the ultra-thin face delivers a lot of power, and the clubhead weighting serves to make the piece very forgiving. While the hybrid looks a bit unusual, but, as one reviewer put it, “if this wacky design works, who cares what it looks like?” The hybrid is made of high quality material, and it will serve a golfer well on the course, and both new and experienced players will appreciate its features; it’s the kind of club that can continue to be used as a player improves.